They say the best way to get to know someone is by taking a walk in their shoes. But we believe it’s by stepping inside their homes. In this series, five local designers allowed us to take a peek into their most private spaces for an intimate glance at their home lives. Read on to learn what’s close at heart to these designers, what pieces were an impulse buy, and what treasures they couldn’t live without. This week, we’re visiting with Pam Kelley. 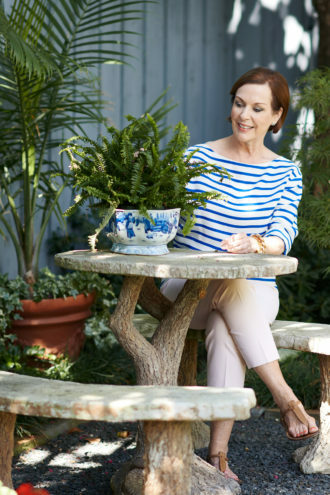 Pam Kelley’s 2,300-square-foot Park Cities cottage is a reflection of her 35-year career. The self-taught designer (she majored in art history in college) has traveled the world for buying trips and personal vacations, collecting antiques and art along the way. Although this home is a bit of a downsize from her previous 6,000-square-foot space, she still made room for all her favorite items. 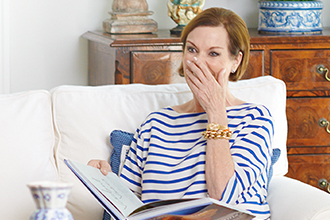 “I love doing the great American home,” the Dallas native says. “My personal style has evolved but never really changed.” She relies on a classic style with a mix of antiques but never pieces that are trendy. And, no matter how elevated the interiors may be, she always keeps a home that is comfortable. “It’s never a museum. Anyone can come in and put their feet up and enjoy a Sunday supper,” she says. This is Kelley’s favorite spot in the house to relax and read a book. “I usually settle in there in the afternoons, especially in the summer when it’s still light outside. I settle in with a glass of wine, and the way the sun comes streaming through that room—it’s my quiet reading place,” she says. 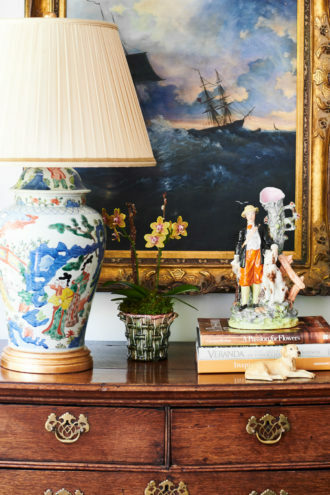 Kelley loves to collect, from religious symbols and blue chinoiserie to chests of drawers. On this 18th-century burl wood chest from Belgium sits a pair of Virgin Mary figurines. “I’m Catholic. I always laugh and say we have great paraphernalia,” she says. Most of her antiques and furniture she’s had for 30 years—pieces she’s picked up through family travels and work trips to England, Scotland, France, and Belgium. The paper-mache and tortoise coffee table is from a Paris flea market buying trip. “I always pick up something here and there,” she says. Blue is one of Kelley’s favorite colors. “You could paint me blue and I’d be happy,” she says. What you give is what you get—and that happened in the most literal sense for Kelley. 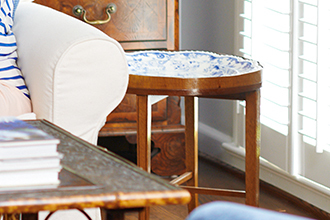 The side table was a piece Kelley found for a client 25 years ago. “I’m remodeling their home and redoing one of the rooms, and they wanted me to have it,” she says. 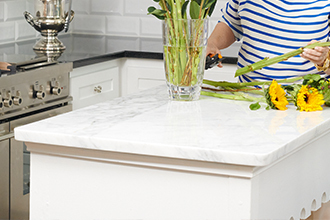 Kelley’s centerpiece of the kitchen is her Bertazzoni range. “I jokingly laugh and say that it’s my hot Italian boyfriend,” she says. She purchased the piece more than six years ago, and now it’s a coveted appliance among home chefs. 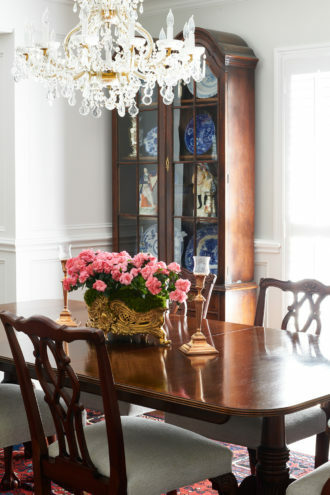 (Left) “The dining room table is one of the first pieces I ever purchased,” she says. Kelley bought the piece in 1979 from the Baker showroom and still loves it. The chandelier is also a piece Kelley has had for years. The Austrian antique was housed in her former entry room, but the scale works nicely in the dining room. 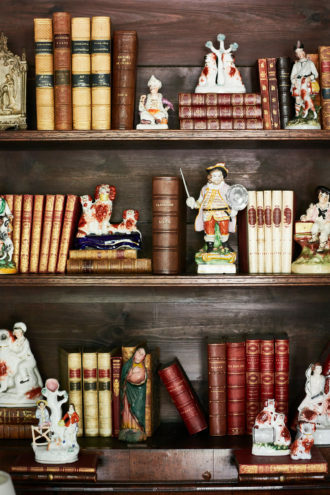 (Left) An Old English secretary desk serves as a display for her Staffordshire collection.